Saturday I could have slept in but, alas, I woke early. With the free wifi in the hotel I found myself surfing the net even before breakfast (no family to keep me in check), and had to question my sanity at this point. When I went down for breakfast it turned out that the whole hotel was firmly in knitterly hands, and once again I chatted non-stop until I had to go and get ready for the meeting itself. At that point of the day I still had hopes of having lunch somewhere but ended up in an ice cream place that was so overwhelmed with all these guests that I sat there, knitting about a third of a sock without even seeing a waiter. Then I left. Next to our tables there were three people shaking their heads exclaiming, “They’re all knitting! All of them! Look! they are all knitting.” They might have been additionally confused by the fact that one of us was in fact, male. 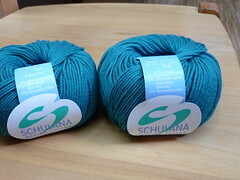 Of course, since I had only bought 200 grams of yarn (at that point) and was wearing my trusty if unfashionable sneakers I was ready for everything. 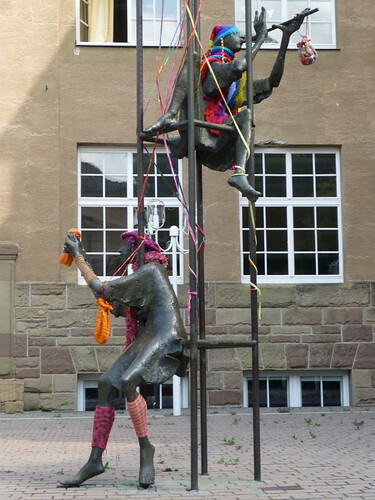 You know, I felt a bit weird at the beginning of the day with my two knitting bags slung over my shoulder but once again – I wasn’t the only one. Knitters and bags seem to got together like hot water and tea. 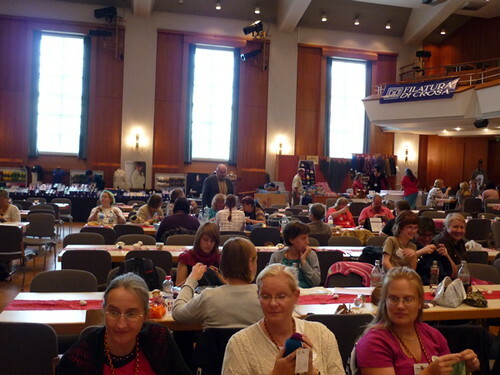 Inside I was greeted by an explosion of color, and a hall full of chatting knitters. Splendid. And then I even managed to grab something to eat and some water. I had been afraid that I would have to teach my first workshop on an empty stomach, not a good thing at all. The one thing that I didn’t like as much was the fact that all the workshops were in the same room. 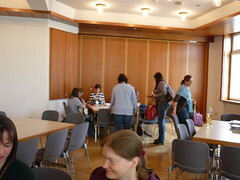 We had big tables and each workshop gathered round one. Originally I had planned to talk a lot in the beginning but then I soon found out that people couldn’t hear me anyway so I just shoved my scripts in front of the participants and told them to start knitting. 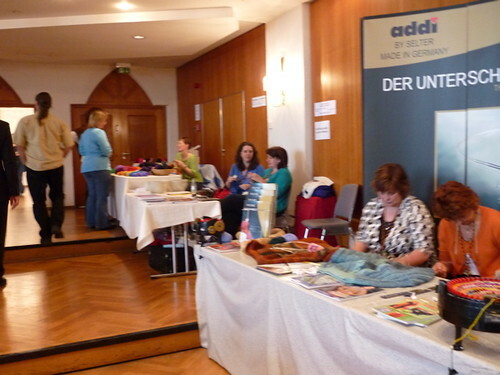 I had been quite nervous because I had never taught a knitting workshop before. I was teaching “sock construction according to Cat Bordhi” and I was afraid that all the participants would sit there, “New Pathways for Sock Knitters” in hand and ask me about wing stitches and what to do if your ankle is that size, and your foot is that size, and all sorts of technical questions that I would then have to look up in the book, and probably screw up. Instead they all were very, very nice. Most were quite competent sock knitters of course, since the topic is somewhat special, but in the end each and every one of them left with their own little sock heel and saw that, yes indeed, it works both toe-up and cuff-down. I even had to explain how to work “wrap & turn” for short rows which I hadn’t expected. It seems that most Germans do what we call “Doppelmaschen” when working short rows. (The link leads to a German pattern. To see a picture of the “Doppelmasche” (that would be double stitch which is not the same thing in English, sorry) scroll down to the bottom.) After a seemingly endless time that I had to wait until everybody finished their gusset increases and that I tried to pass by telling interesting bits about sock construction and knitting in general, and by simultaneously knitting a gusset myself which I then screwed up because I can’t teach and keep track of my sock heel without using a row counter. Then instead of using my very big prepared sock heels for demonstration I just went round the table and showed everyone individually. It’s truly amazing how different people knit. Some are very fast, some are much slower, and they all look different even though I only had “continental knitters” in my group. 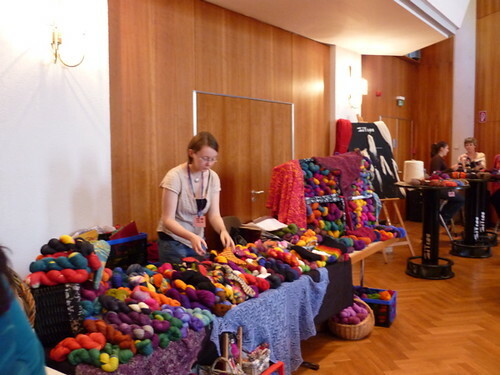 After my own workshop I went back to the big hall and bought yarn. And talked, and met people, and took out my spindle to spin with some of the others. 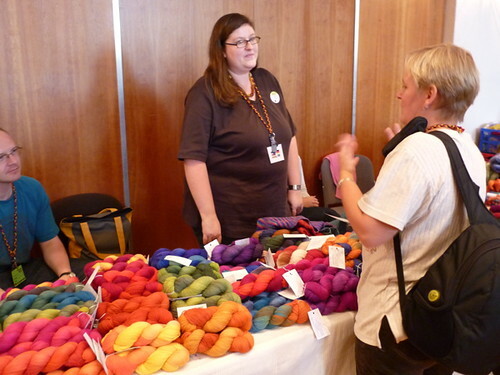 Then I just sat down with a couple of people I had met before because I experienced a bit of people and yarn overload. After that I went directly to the after-hours-party, I think. 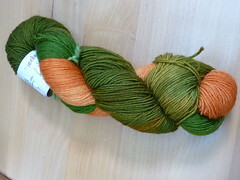 (That can’t be, I must have unloaded my two bags of shiny new yarn and fiber first.) We had excellent food there, buffet style, I had some beer, and talked and talked. I enjoyed the talking so much that I stayed way later than I had wanted. The beer was a bit of a disappointment, by the way. I like to sample local beer, and I had some at the place where we ate the night before but this very excellent restaurant only had beer that is local to Munich. And when I’m home I don’t usually drink it because there is better stuff to have. So I went home late, then decided to finish off my half-bottle of wine afterwards while reading. Which – somehow – led to me being somewhat late on Sunday. Interestingly I didn’t have a headache. Must have been good wine.